It looks as though it should be used for administering laudanum! 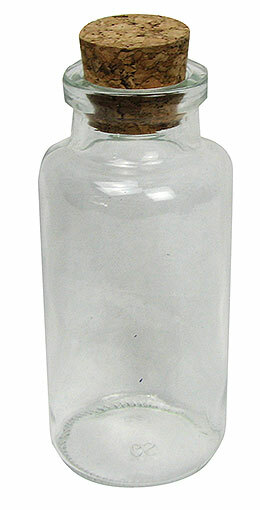 A 30mL, 1-1/4" sq x 3" tall clear glass bottle, it has thick molded sides and a heavy lip: very antique in appearance. It is stoppered with a red(!) rubber stopper which is the squeeze bulb for the glass dropper tube inside. A real eye catcher, but give it a good wash please. It clearly is not sterile. 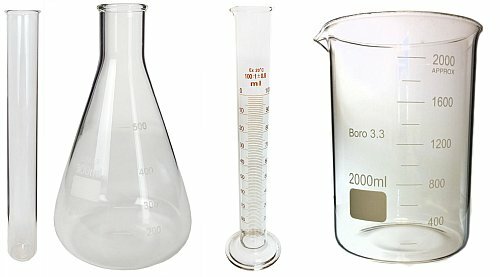 Rejoice, we have finally found a source of reasonably priced borosilicate lab glassware. This is the kind of glass in the trade marked Pyrex(tm) and Kimax(tm) labware. The stuff you can put right over the flame of the Bunsen burner, or directly onto the hot plate. This stuff is imported from China, and is considered student grade, which is good enough for anything but the most exotic applications. We have beakers, test tubes, graduated cylinders and flasks. Compare the prices below and you will see that they are around half the U.S. equivalent. Call us for larger quantity prices. Please Note: Physical sizes may vary slightly due to vendor and Mfg changes. Call or email for more info. Has Your Coffee Graduated Yet? In the lab or kitchen, these clear borosilicate glass mugs have a handle and lip and remind you that science is part of your every day. 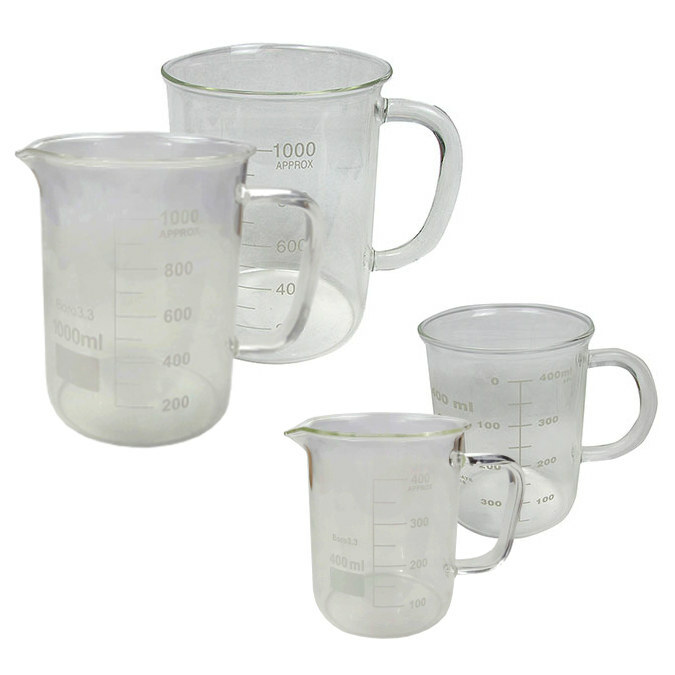 The smaller 400mL one has graduations in 50mL increments and the larger 1000mL one in 100mL increments with numeric markings every 100mL or 200mL accordingly; both with more room before you have to worry about spilling. Not intended for serious lab use as the volumes are approximates. Remember to ask for 236.5ml of coffee the next time you visit your favorite diner. Make roll-on deodorant for gerbils. Or use these 2ml clear glass bottles to dispense essential oils, samples or anything you want to provide in very small quantities. 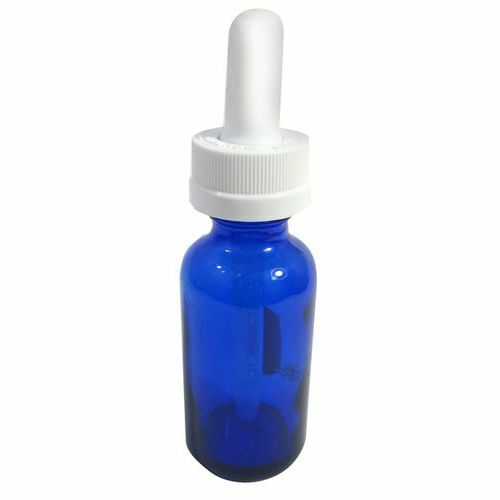 Bottles have a 9/32" sleeve with a 1/4" steel ball, and measure 9/16” dia x 1-3/16” tall, including the threaded black plastic screw cap. Bottle, ball and cap come unassembled. It’s asking for it. 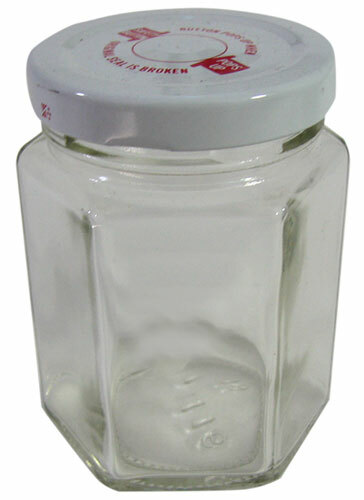 Our clear glass jar measures 5” tall x 2-3/16” dia with a 1-3/8” dia neck and a 1” ID mouth. Holds approx 6 oz, and comes with a matching cork, because it would be stupid if it came with a cork that didn’t match. 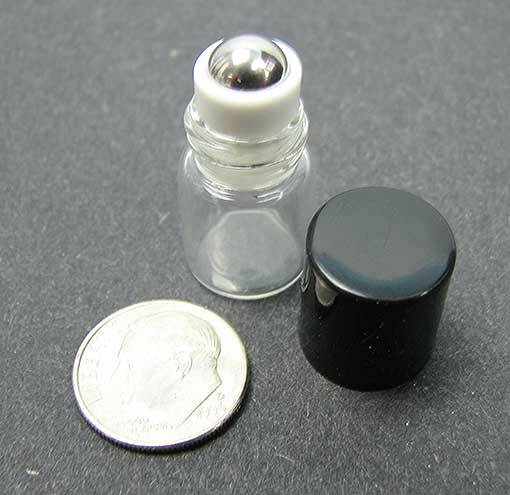 These cute little 2-oz clear glass round jars are 2” dia x 2-1/2” tall counting the black plastic screw caps. With their non-gasketed caps and clean design, they’re great for workshops, craft rooms and bathrooms. Fill them with glitter, tacks, rubber bands, stamps, screws, lotions or potions. Mustardish style, at least in our artisanal grocery. 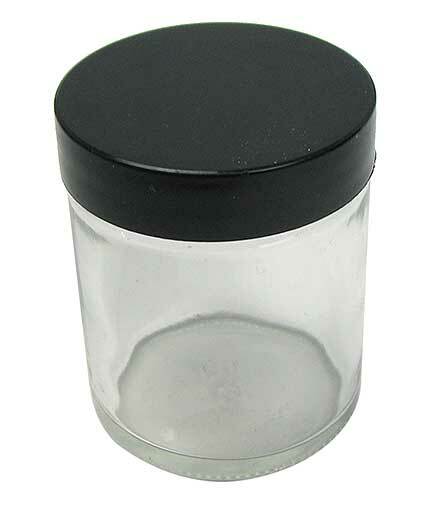 The six-sided clear glass jars hold 6.5 ounces each and measure 3-1/2" tall x 2-1/4" across with a 2" mouth and a white metal gasketed screw cap. Ideal for storing screws, nails, thumbtacks and other junk drawer staples. 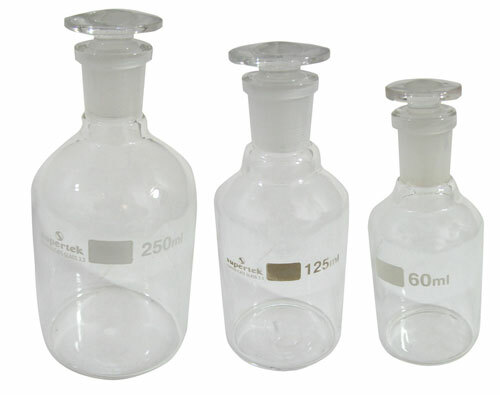 You pick small, medium or large borosilicate reagent bottles, all with ground glass stopper. Small is 60ml, 3-5/8" tall x 1-5/8" dia with a 7/8" long neck and a 1/2" ID mouth. Medium is 125ml, 4-3/4" tall x 2-1/8" dia with a 1" tall neck and an 11/16" ID mouth. Large is 250ml, 5-3/8" tall x 2-3/4" dia with a 1" long neck and a nearly 3/4" ID mouth. Made in India. "Very interesting," our chief bottle washer said. 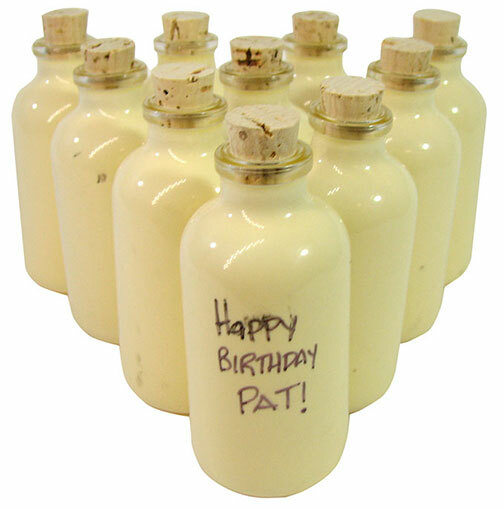 This 3-1/16" tall x 1-7/16" dia corked glass bottle has a cream-colored rubber coating on the outside and a 15/32" ID mouth, with a little lip like an old-time baby bottle. The coating may make the bottle less likely to break if you drop it, It will certainly make it less likely to scatter shards of glass all over the floor! 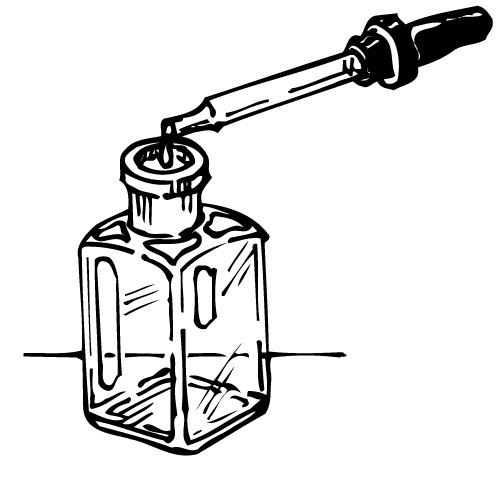 Holds approx 30ml (1 oz). Now with corks included and perfect for writing special messages on. 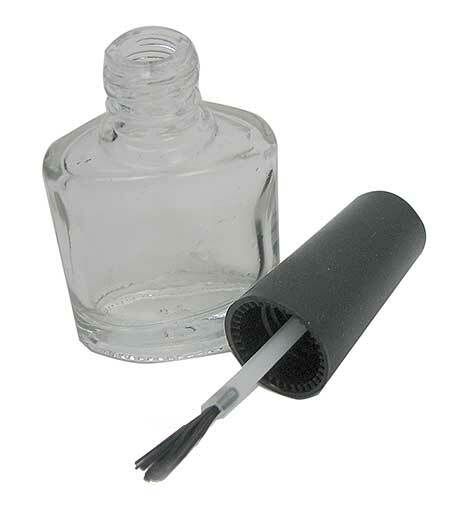 Our clear-glass brush bottles look empty, but that’s just because you can’t see the imaginary nail polish inside. They hold 5ml (1/5 teaspoon), and measure 1-1/4" x 3/4" oval x 1-1/4" tall with a screw cap that has a 3/16” wide brush attached. What do you use imaginary nail polish for? Painting imaginary fingernails. What do you use these bottles for? Craft, model, aromatherapy and DIY paint projects, among many others. Use your imagination. These blue glass dropper bottles are the color of the cold cream bottles that everybody's mother used when everybody's mother used cold cream. Measure 3-1/8" tall x 1-15/16" dia and hold (1) oz. 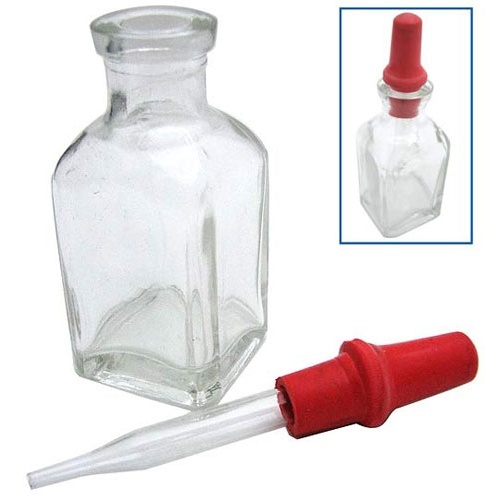 Plastic safety dropper cap is 2-3/8" tall and marked at 0.4 and 0.8ml.